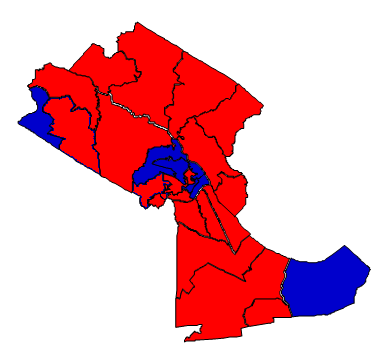 Craven County is located in North Carolina’s coastal plain region. The county seat is New Bern, one of the oldest towns in North Carolina. As of 2010, the county population was 103,505. The county seat, New Bern, has played a significant role throughout North Carolina’s history, serving as the state capital before Raleigh was established. New Bern is well-known for Tryon Palace, home of royal governors William Tryon and Josiah Martin. New Bern is also the birthplace of Pepsi-Cola. Since 1980, Craven has supported Republican candidates for President. In 2012, Mitt Romney won the county by a 58-41 margin. The County Commission is controlled by Republicans. Democrats have a small 39-34 lead on Republicans in terms of voter registration, but most of the unaffiliated voters trend Republican. The racial breakdown in Craven is similar to the statewide breakdown, but Craven County whites are more conservative than the state average. Mitt Romney won an estimated 78% of white voters here. Geographically, Democrats can count on strong support from areas of New Bern that are less affluent. In the wealthier neighborhoods and the rural areas outside of the city, there is heavy Republican support. Recent transplants, many of them retirees, have shown a marked preference for Republican candidates, despite a tendency to register as Unaffiliated. Forecast: Although there has been a significant increase in black registration in the past few years, Craven is expected to trend Republican. In recent years, New Bern has seen an influx of Republican-leaning voters. The situation is similar in many other coastal counties. But more important is the disparity between the growth rates for the individual races. During the 2000s, the black population barely grew at 0.99%. But the white population grew by 13.27%. This has resulted in a decrease in the overall black composition of the population – from 25% in 2000 to 22% in 2010. Should these demographic changes continue, Craven will become even more Republican. However, the growth rate in Craven has greatly slowed with the onset of the Great Recession. What seems certain is that Obama’s 43% share in 2008 was something of a high-water mark for Democrats. It’s possible that Hillary Clinton could top that if she runs in 2016, but don’t look for her, or any other Democrat, to be able to win the county. Craven County has not been a friendly environment for Democrats in recent years, and if anything it’s projected to get worse for them. In coastal counties, an influx of affluent white voters favors Republicans. In the case of counties like Craven, Brunswick, and Pender, demographic change favors the GOP.